IdealLean Pre-Workout Review - Can it Enhance Your Workout? Home » Reviews » IdealLean Pre-Workout Review – Can it Enhance Your Workout? Holding its own as one of the most popular pre-workouts for women is IdealLean Pre-Workout. Part of IdealFit’s range of supplements created specifically for women, with the needs of females in mind, this pre-workout is no different. It claims to provide power, energy and intensity, while aligning itself with women’s fitness goals, by boasting a formula that will make you leaner and more toned. We’re all about creating a leaner, more toned body, however this claim as to how it suits women specifically seems a little shallow. A leaner, more toned body is the overall goal that applies to just about every pre-workout. We need to know more about how the formula has been created, measured and selected to suit the physiological needs of females on a cellular level. To find out if it really is a top shelf pre-workout for women, we need to perform an IdealLean Pre-Workout review. We’ll delve into the formula to establish some key pieces of information. Namely we want to know if the selected ingredients and dosages will reap rewards, aligned with the key promises of a pre-workout supplement and the needs of women. To establish this, we want to know if the ingredients are well-researched and proven to work. We look into the science surrounding each ingredient and use this to find out how potent the ingredient is and at what dosage you can expect the best results. As we do this, we also want to ensure it’s entirely safe to use in the long run, because a pre-workout should be ready to use whenever you need to hit the gym. It should also be clear of undisclosed proprietary blends to ensure effectiveness and reduce the risk of side effects. We also compare our findings with online reviews. This allows us to get a good idea of how well the formula performs in more than one real-life situation. We can look at the good, the bad and even how tasty the flavor is. This complete view of how it performs for a larger pool of fitness fanatics gives us a clear idea of how well received the product is, and whether you can really expect results when it’s in action. Once we have all this information, we can quite easily establish the value of the product. If it’s good value it will be effective, and therefore be worth the money you spend on it. If it provides no tangible benefits, and is generally expensive, it’s bad value for money. With a good idea of how valuable the product really is, you can make a more informed decision on whether the product is worth your money. Our review process has been used to separate the wheat from the chaff on countless supplements. We’ve carefully developed our processes over the years to provide the most comprehensive and informed view of whether a pre-workout can deliver results and, ultimately, to find out if it’s worth your time and money. What are the benefits of taking IdealLean Pre-Workout? How do you take IdealLean Pre-Workout? How much is IdealLean Pre-Workout? On the whole, your main benefit from taking IdealLean Pre-Workout will be longer training sessions, where you can put in more effort and get more out of every workout. It should do this by providing pillars of support that all contribute to this overall goal. These supports come from the ingredients within the mix. The caffeine in this mix can help to boost your energy levels so you’re physically and mentally prepared to tackle any workout. The extra energy can help to improve motivation, increase the length of your session and even enhance the power of muscle contractions. There are ingredients within this mix that improve the way your body handles fatigue. This allows you to work out for longer and add a few extra reps to your session. With heightened training volume, your body will be put under additional strain, which translates as more muscle. Vasodilators within this formula work together to give your muscles an aesthetic edge. They expand the size of the blood vessels within your muscles, so they look and feel bigger. While this is only temporary and doesn’t increase strength, it contributes to endurance. All of these add up to a bigger, more beneficial workout which powers you on to one thing – higher rates of strength and muscle-building success. If you can work harder and do more, you’ll feel the results in accelerated progress. It’s worth noting that one benefit we’re missing here is heightened power output due to the lack of creatine in this formula. We think the mix could benefit from this to complement the endurance heightening elements of the supplement. 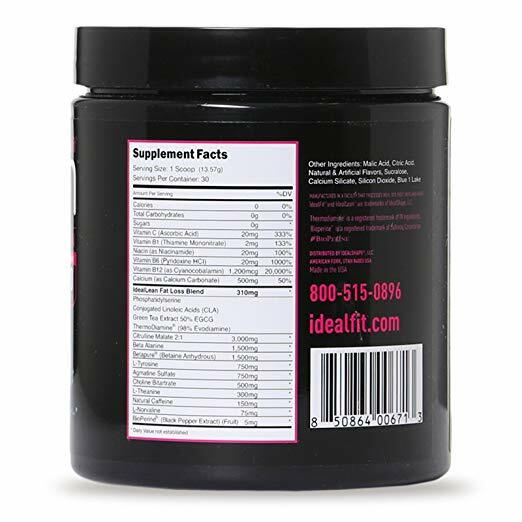 IdealLean also claim that the addition of their IdealLean Fat Loss Blend will bring the extra benefit of burning fat and helping you achieve a toned physique. After reviewing the dose and the ingredients within the blend, we found it to be too small to have any real impact on fat burning, writing it off as a benefit and potentially detracting from the effectiveness of the pre-workout. This pre-workout is completely natural, which usually means we trust it completely in terms of safety. However, this mix contains a small proprietary blend called the IdealLean Fat Loss Blend. Despite this addition, we still rate it well in terms of safety. Each ingredient within the blend has been disclosed and they’re all entirely natural. On top of that, the dose within the mix is very low, rendering the ingredients within the “fat loss blend” pretty much worthless and therefore safe to use. This pre-workout, as so many do, contains caffeine. What makes it different is it has a very good amount of the stimulant. By that, we mean enough to be effective, yet won’t give you any unwanted side effects. However, if you’re sensitive to caffeine, we recommend you take additional care with your stimulant consumption throughout the rest of the day. Reduce your intake by cutting down on coffee and tea around the times you’d like to take your pre-workout. You should also never take a supplement containing caffeine if there’s any chance you could be pregnant. Consult your physician if you’re concerned about any of the above before you make a purchase. Despite this, we’d be happy to give IdealLean Pre-Workout the thumbs up for safety. Including the Fat Loss Blend, IdealLean contains 14 ingredients. To us, this is a few too many, as overfilling a supplement leads to under-dosing and an ineffective formula. We’d prefer to see a more generous and measured approach to pre-workout supplementation, selecting only the most important ingredients, at the right doses to create a truly powerful mix. We’ve pulled together all the main players in this formula, so you can get a better idea of where IdealLean Pre-Workout performs and where it’s lacking. Extracted from watermelon, this amino acid is a widely used and scientifically-backed vasodilator . It heightens levels of nitric oxide in your body, which expands the size of the blood vessels within your muscles. Due to this, more blood can flow through your muscles, which increases their size for heightened ‘muscle pumps’. You may think increased size means more strength, however that’s not the case. It won’t make you stronger, but it has been proven to improve muscle endurance for a longer workout, and increased output. We’re happy to see this powerful ingredient in the mix, however, we’d like to see it at a higher dosage. A measure of 3000mg sits at around half the optimal amount . When consumed, this is converted to carnosine within the body. Higher levels of carnosine have been shown to help stave off the painful, fatigue-inducing effects of lactic acid . By adding an extra layer of protection against these toxins, you can work out for longer without having to stop due to pain. Although we’re happy to see this in the mix, the most scientifically proven and purest form of the ingredient comes under the CarnoSyn® brand. This is the only protected form of the ingredient that guarantees quality and the only one that’s proven to be effective in research trials. In a few studies, betaine anhydrous has been linked to heightened performance. Specifically, it’s been linked to increasing power output in a workout when tested with experienced athletes. However, the supplement is still under-studied and whatever proof there is suggesting it can improve physical performance has been disproven in a number of other research trials. Without strong scientific backing, we don’t think this is the most informed choice when it comes to finding a power-boosting supplement. Instead, we’d rather see the widely-proven and highly-researched creatine in the mix. A lot of pre-workouts get a bad rep for including caffeine in ridiculous servings, as they should. However, when correctly dosed, this stimulant can be a huge benefit to a pre-workout supplement. Countless studies have proven it can heighten your energy levels, both mentally and physically to help you stay motivated to hit the gym . To complement that, science has shown you can also expect a longer session when you supplement with caffeine. As well as increasing endurance and therefore total power output, it has also been shown to increase muscle contraction strength, so you can lift heavier too . This is a very intelligent addition to a pre-workout, and it shows an attempt at smart supplementation. L-theanine creates a feeling of calm focus, that gives you a mental edge in your workouts that has been proven to help you stay motivated and ‘in the zone’ . When combined with caffeine, the two have been shown to work synergistically to elevate your workout . The caffeine provides stimulation, whereas l-theanine helps to encourage a clean, smooth lift and keeps jitters and crashes at bay. By combining the two, you can expect mental clarity as well as physical prowess. We’d like to say that we’re missing a key ingredient in this formula. Where Betapure® fails to deliver explosive power, we know creatine can. By removing this ingredient and swapping out with something more diligently researched, we can create a formula that can really work. It’s also worth mentioning that the proprietary ‘fat loss’ blend is entirely unnecessary within this formula and is detracting from the overall effects by taking up precious space. Although we recognize the power of the ingredients, we also know that the dosages are far too small to have any real impact on body composition. For the best possible experience, we recommend you follow the advice of the manufacturers when it comes to taking a supplement. The ingredients are dosed to a certain level for a reason, so under- or over-consumption can impact both the effectiveness and the safety of IdealLean Pre-Workout. Take a single scoop of IdealLean Pre-Workout with 8-10 fl.oz of water around 20-30 minutes before you head to the gym. We’d also say avoid taking this supplement within 5 hours of going to bed, otherwise it could impact your ability to sleep. A single container of IdealLean Pre-Workout offers 30 servings. This should be enough to last you around a month, depending how often you work out. It’s clear this supplement has potential. However, there are a few areas where tweaks to the formula could transform it into a formidable contender in the world of pre-workouts. First up, IdealLean Pre-Workout will help to increase your endurance. By pulling in a longer, more rewarding session, you can increase your total work output, which leads to enhanced muscle gains. There are attempts to improve your power output in this formula, however we don’t think the ingredients or dosage used will offer optimal benefits. It can also provide a clean, yet powerful energy lift, due to the addition of optimal caffeine levels. It’s an appropriate contribution to a women’s supplement, as we’re more susceptible to the potential side effects of high caffeine dosages. We’ve carefully analyzed the formula, paying extra attention to the proprietary blend to ensure it’s entirely safe to use. On the whole, we found it to be free of risks, based on the fact it’s an entirely natural formula containing well-dosed stimulants that are suitable for women. All these elements will add up to improve your physical performance, but not to the maximum extent you might expect from a top-quality pre-workout. For example, the IdealLean Fat Loss Blend provides no real benefit in terms of weight loss and detracts from the quality of the pre-workout by taking up space within the formula. It feels like it’s just been added to appeal to women, when in reality it makes the supplement less effective. There are also under-researched ingredients within this supplement, such as Betapure® which we cannot definitively say provides any real benefits. Some of the ingredients we do like to see, such as citrulline malate, are under-dosed, which may be the result of using unproven and unnecessary ingredients. We’d also say we’d like to see the addition of creatine in this formula. By adding it to the formula, we could say it provides power, due to the sheer amount of positive research behind the supplement. Despite these issues, we still think good elements we found in IdealLean Pre-Workout can have a positive impact on your workouts. However, we found the price is too high for a supplement that falls down in some essential areas. As such, we wouldn’t say it’s great value for money. It’s definitely not the best pre-workout for women, but it will help to boost your overall performance, just not in a way that will reap the most reward. Overall, we’d call it a mild pre-workout, so if that’s something you’re looking for, then IdealLean is the one for you. 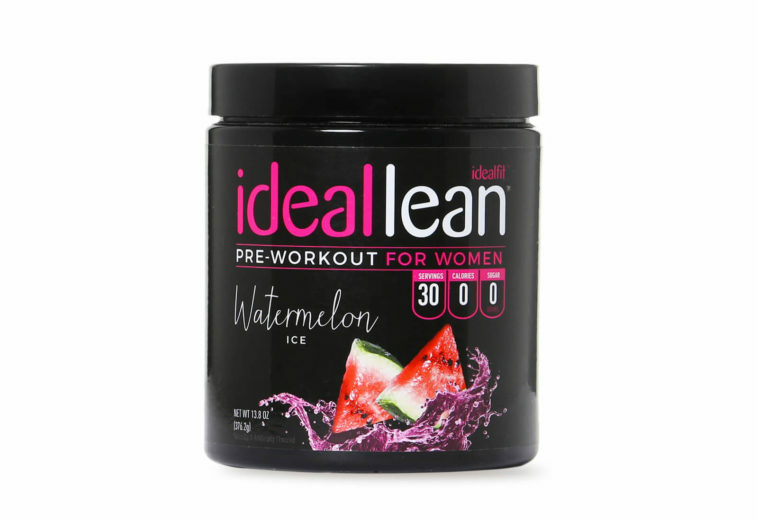 Find out how well IdealLean performs against other products in this category in our complete review of all the best pre-workouts for women. Hobson, R M et al. “Effects of β-alanine supplementation on exercise performance: a meta-analysis” Amino acids vol. 43,1 (2012): 25-37.